Save time by editing multiple inventory items at once. Update any field(s) you like that meet the conditions that you define. 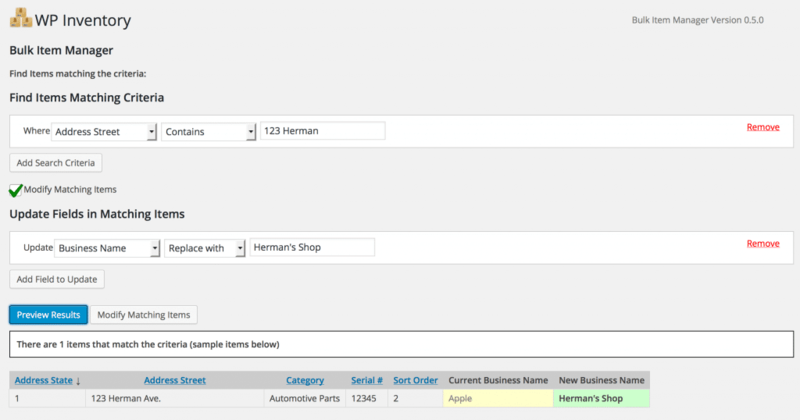 Delete multiple items based on the conditions that you define, all within a simple easy-to-use interface. Ideal for the large database of inventory and a huge time saver. For example, find all inventory items that have the text “123 Herman” in the street name. Or, find all items that are priced over $95. You can do that and more, showing you a preview of the items that match the conditions you have set. Then you can delete them, or change them, including adding, multiplying, replacing, or more. For example, say a business changes it’s name. It would be logical to assume the business is tied to it’s address. So, we can find any street address that matches a certain string (123 Herman) and then update that business name. As illustrated above, the former business name was “Apple”. We are changing that to “Herman’s Shop”. The preview allows you to see the change before finally submitting. * Fix bug with id column appearing in the preview results. * Update to work with new last updated field added in core. * Update to work with new core plugin item filter pattern. * Fix bug with preview of changes when modifying AIM records. * Add filter for counts of records modified. * Upgrade to utilize new dashboard functions.